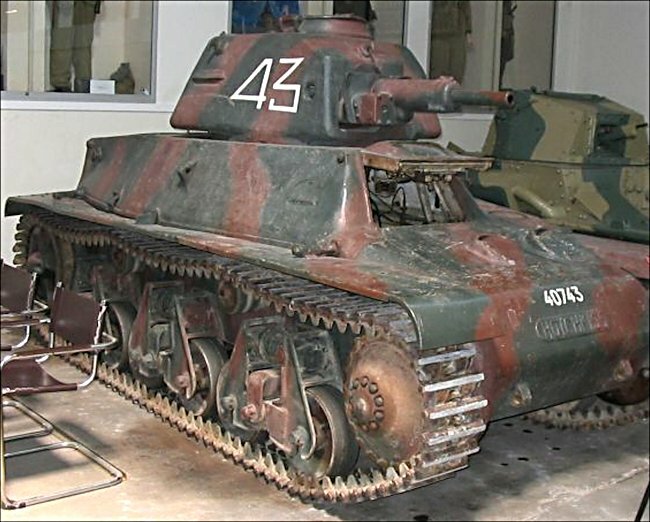 This French Hotchkiss H39 tank can be found at the French Tank Museum in Saumur in the Loire Valley. The Museum is called Musée des Blindés ou Association des Amis du Musée des Blindés, 1043, route de Fontevraud, 49400 Saumur, France www.museedesblindes.fr . The word Blindés means armoured. In early 1940, just in time for the German invasion of France the Hotchkiss H35 medium tank was upgraded to the H39 with a longer L/35 37 mm SA38 gun with a much improved anti-tank capability. It could now penetrate the 30 mm of frontal armour at 1,000 meters. This meant that the Hotchkiss H39 could knock out any of the tanks used by the Germans during their Blitzkriegs attack in 1940. All new tanks were fitted with this gun and about 350 vehicles were rebuilt with the better gun. The Hotchkiss H 35 light cavalry tank appeared at the same time as the Renault R 35. They were both alike in appearance. However the Hotchkiss H 35 tank used narrower coil springs on it suspension system. The Renault R 35 used wider rubber washers. This enabled the Hotchkiss tank to be fitted with one extra road wheel either side of the vehicle. This allowed for better cross-country performance and a high-speed. Over 1000 Hotchkiss tanks were produced and with the bigger Somau S 35 medium tanks, they formed the backbone of the cavalry light mechanised divisions DLM. Some were issued to the light battlions of the heavy tank DCR armoured divisions when they were formed in 1939–40. Each of these mechanised cavalry divisions had one Regiment of two squadrons equipped with S35 tanks along with a Regiment of Hotchkiss H39 tanks. French Calvary H39 tank commander Sergeant-Major Georges Hillion of the 4th Squadron Cuirassiers (Dreadnaught Squadron) recalls, "My first target! I fired and saw a direct hit. The panzer stopped and I saw a brilliant light and smoke pouring out of the tank. I dispatched another. I was aware of some suspicious knocking on the tank from incoming machine-gun fire. " "We were fighting a mixture of tanks and infantry in among trees when we received our first strike on the rear of the tank, which immediately stopped. Corporal Phiz, my driver was unable to restart the engine. We were stranded in the open 300 meters in front of the enemy, who immediately concentrated their fire on the stricken vehicle." "A shell burst through the turret, I was wounded in the face and left arm: blood covered my face and I could no longer see out of my left eye. We fought on as shell after shell hit our tank. The 40mm of armour protection was able to soak up much of the punishment. I tried to carry on firing my machine gun using my right eye to find targets until a powerful shock struck just behind me." "I felt a violent pain in the back and a burning sensation on the whole left side of my face. Dense smoke filled the tank. I continued to fire but was unable to see if I hit anything. As further rounds slammed into the tank our situation became untenable. I was suffocating. I leaned down to take off my scarf to try and wrap it around my face and in front of my mouth, but another violent hit struck the turret." "I could not breath. I was choking on the smoke. I could feel my strength going. I clambered out of the tank taking the machine gun with me. Another terrific blow hit the tank, knocking my helmet off, forcing me to tumble to the floor." "I was knocked unconscious but awoke with a terrible pain. I opened my right eye and saw an enemy tank rolling over both my legs, the edge of the track just below my knees. The panzer tank commander was scanning the area. Fearing he might fire a mercy shot, I strove to keep quiet. The panzer moved off towards the hedgerows. Shells suddenly rained down and I was wounded again by shell splinters to my left hand. I was covered with clods of earth. I fainted again. I was lucky. My driver was dead. The regiment lost 24 Hotchkiss tanks that day." Sergeant-Major Georges Hillion fought on as shell after German shell crashed into his Hotchkiss H39 tank. Its 40mm armour protection was able to soak up much punishment. It was only after the tank was immobilised did the enemy managed to fire into the rear and sides of his tank. An anti-tank round entering the crew compartment was often accompanied by a searing flash of kinetic energy produced by its violent passage. It cause dangerous sharp metal flakes and scabs to fly off the inside of the turret and crew compartment from the shock of impact. The Germans noted in after action reports the slowness of the French turret traversing mechanisms. This was taken advantage of by using this sluggish turning to enable the Germans to rush the French H39 tanks and shoot them up from the side and rear. This discovery was passed to other German panzers by radio. Where can I find other preserved Hotchkiss H39 tanks?